Woodland Manor offers function room hire in an inspiring rural setting. Our beautiful country house is surrounded by acres of woodland gardens, ensuring complete privacy and an environment free from distractions. Luxuriant outdoor spaces are ideal for break-out groups and alfresco teambuilding activities. Inside meanwhile, are four dedicated conference rooms, arranged to meet the exact requirements of our guests. If you require entertainment, Woodland Manor works in partnership with a number of professional companies that can help to stage sensational corporate events, including summer balls, hog roasts, team building activities and Christmas parties. Despite our secluded location in the heart of the Bedfordshire countryside, Woodland Manor provides easy access to and from many major cities, including Cambridge, London and Oxford. We are located just two miles from Bedford town centre and the well-connected local train station. Additionally, our venue has great links to the A1 and M1, with free parking on-site for around 100 delegates. Woodland Manor features three dedicated meeting rooms. Each versatile space can be tailored to match your exact requirements. 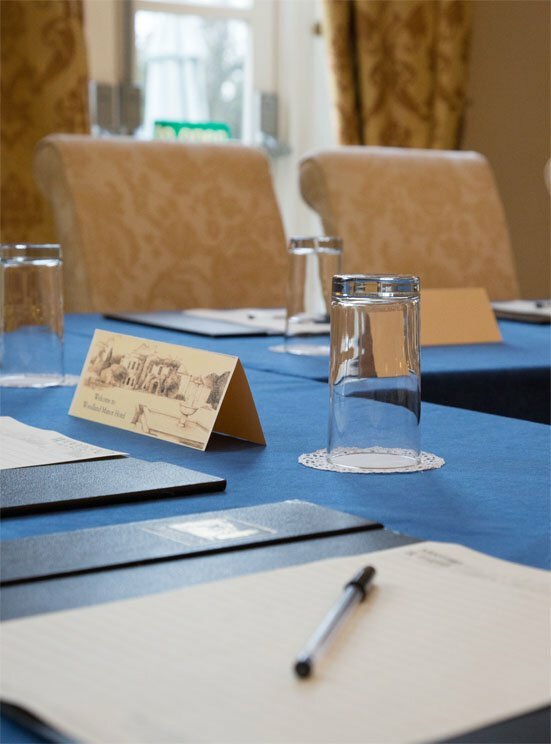 Autograph: a spacious room ideal for large meetings. This room has enough capacity for up to 120 delegates seated theatre style and offers direct access to gardens and grounds. Conservatory: this room is perfect for intimate meetings but still spacious enough for as many as 33 delegates seated theatre style. Library: an atmospheric space, ideal for situation where focus and inspiration are priorities. The room has direct access to gardens and grounds. When arranged theatre style, this room has space for up to 44 delegates. We are very proud of the extremely high standard of service that we provide for all of our guests. We take time to understand the exact requirements of corporate visitors, and specialise in tailoring every event to meet individual needs. Our friendly and professional team offers attentive but unobtrusive service and can provide you with additional materials, such as flip boards, large television screens and stationary. From a light networking breakfast to something more substantial before an important business meeting, our corporate guests have plenty of dining options. Choose fine dining with our stylish restaurant, or opt for something more informal with our cosy bar. Our menu includes a range of delicious dishes from the British Isles and around the globe, with a wide selection of international wines and beers to match.